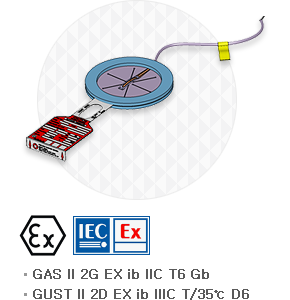 Burst sensor [KSBS-A] is a rupture detection sensor for a Rupture Disc. 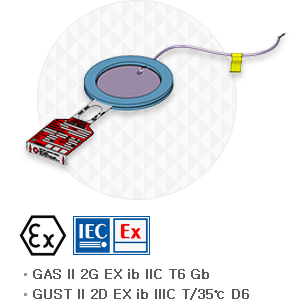 It is installed on top of the Rupture Disc Holder and maintains signals when it is on. When it becomes off with sensor film broken when the pressure in a Tank or a pipe exceeds the rated pressure, separate monitoring device or DCS can detect the rupture. Burst sensor [KSBS-B] is attached to Rupture Disc as a built in sensor. It maintains on signal in normal status but when pressure in the tank or the pipe exceeds the rated pressure, the sensor film is broken when the rupture disc is ruptured so that separate monitoring device or DCS device can detect the abnormality. 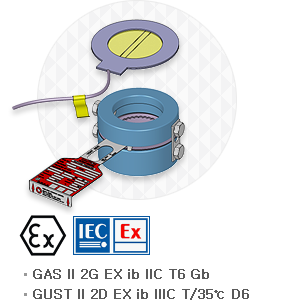 Burst sensor [KSBS-C] is a cable type sensor installed in a rupture disc as a built-in sensor. It maintains on signal in normal status but when pressure in the tank or the pipe exceeds the rated pressure, random short point in the cable is broken when the rupture disc is ruptured so that separate monitoring device or DCS device can detect the abnormality.